According to my knowledge you adding custom template-skin to your blogger layout or may you have removed some code or you might have remove this code to setup Facebook comments for blogger. When my friend have this issue ask me to help with this issue and I started too. Comparing other default template and this template but not found the error about hardly trying of 6 hours. Almost compared all section of blogger but found nothing, which was more frustrating at that time. At last I found this issue in the starting point of the code, sometimes solution is in front of you but we does not look at it. Now you are good to go Hurray! 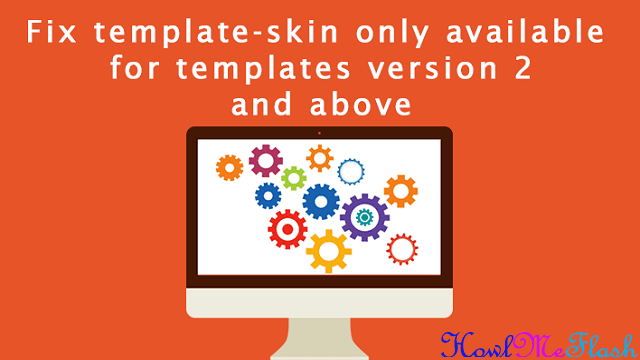 So this was our guide on How to Fix template-skin only available for templates version 2 and above on Blogger , I hope the methods given above helped you.